Well it's the end of another week! Big plans for the weekend? Not much going on here for sure. Yesterday I had some plans fall through, so I used the time for a leisurely coffee morning followed by some sewing. The mornings have been cool which has been delightful. This month was Nanette's turn to request a Sweet Bee Block. She chose a courthouse steps block with a fussy cut floral center. I finally printed out the instructions and got my fabrics cut. I selected a piece of my favorite floral for the center and carefully cut out a little bouquet of flowers. Once cut the block goes together in just a few minutes. Like under 10 minutes and that's with some dawdling in between. Now I need to pack up the block and send it away to Nanette. My turn is next month, and I'm working on my block so I'm ready with instructions! It's hard to choose what to make, but I'm closing in on my decision! Hope you have a good weekend everyone !! 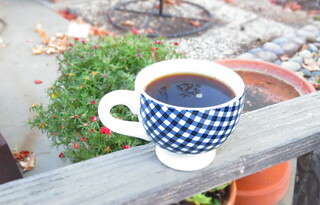 PS: love the coffee photos! 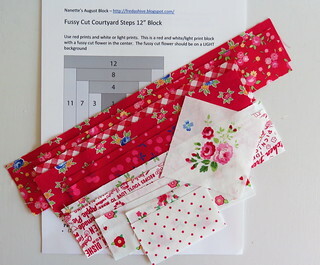 Your pretty fabrics always make for a happy block. I like that even though it's a red and white block, there are splashes of color, blue, green yellow! Sew cheerful. I am sure that Nanette will like it. I enjoy reading your blog in the morning, thanks for sharing. Its friday!! hurrah, lunch tomorrow with a dear friend and then much sewing I hope for a 3 day weekend. 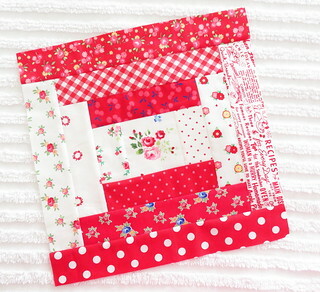 That is a pretty block made with adorable fabric!! Your block for Nanette looks great. This block was so much fun to make.